Use mbed in an industrial environment ? 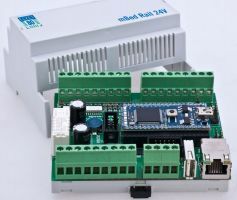 With an EMC-optimized circuit design, optoisolated inputs and a DIN 43880-rail mount enclosure it works! Digital outputs 24V, analog inputs for 0..20 mA process current and an RS485 extension bus - equipped with screw terminals. 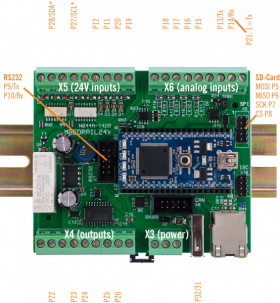 Populate this industrial i/o-board with your mbed NXP LPC1768 or with one of our kBed Kinetis Cortex-M4 modules. 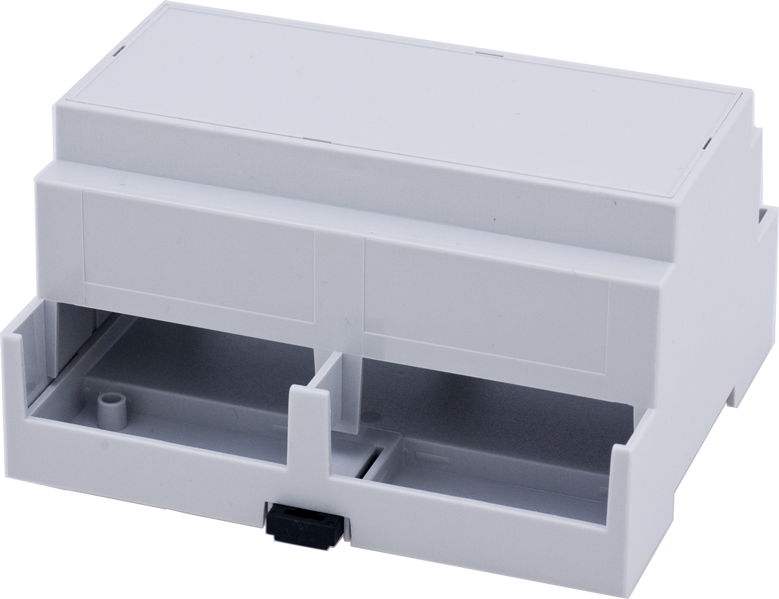 Custom controls and interfaces in the enclosure cover may be integrated according to your specification, even in small quantities. mbed industrial module with 24V I / O for inserting a processor module NXP LPC1768 or KBED K60 (not included). Without rail mount enclosure CamdenBoss CNMB/6/KIT. 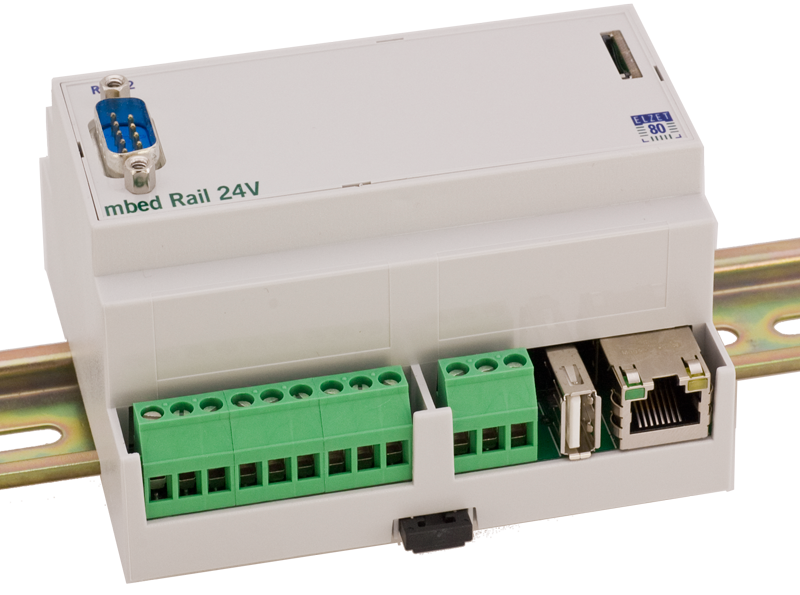 DIN 43880 rail enclosure with 24V I / O for inserting a processor module NXP LPC1768 or KBED K60 (not included). Allows the use of mbed/kBed in a harsh cabinet environment. DIN 43880 mbed DIN rail enclosure with 24V I / O for inserting a processor module NXP LPC1768 or KBED K60 (not included). SD-Card slot and RS232 integrated in front panel. Why not have mbed perfectly suit your requirements? Whether in this enclosure or fitting into any other space - let us arrange drivers, relays, signal conditioning around mbed for your particular application. There is some setup cost for the layout but often we might save you a lot of external wiring. 25 units minimum order. Eight accurate load resistors for the four analog inputs for measuring 0 / 4..20mA process current signals. Installed and tested, if ordered with the module, otherwise loose. Rail mount enclosure CamdenBoss CNMB/6/KIT for NET-MBEDRAIL24V. 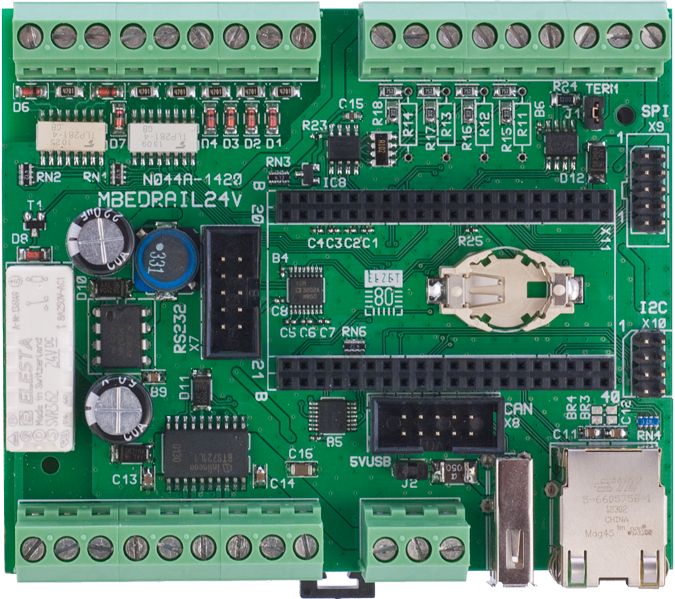 If you use the NXP LPC1768 mbed module in MBEDRAIL24V, you can use all of its I/O pins. Four outputs 24V / 1A for valves or relays, four inputs 24V opto-isolated, the 8A relay with two-way output (eg for reversing a motor), four analog inputs voltage or current, and a RS485 port for I/O expansion. The external usb port may be used for a usb stick, to save log data, or for other usb applications supported by mbed LPC1768 modules. Internally you find some (serial) I/O ports on pin headers: SER0 with RS232 drivers, I²C, SPI and CAN. We can provide custom front panels to make these ports accessable for your peripherals. The advantage of free online programming of mbed modules is not limited by mbed Rail 24V. (ELZET80 assumes no liability for the data storage or the availability of mbed.org). If you are not yet a member, simply register with mbed.org. 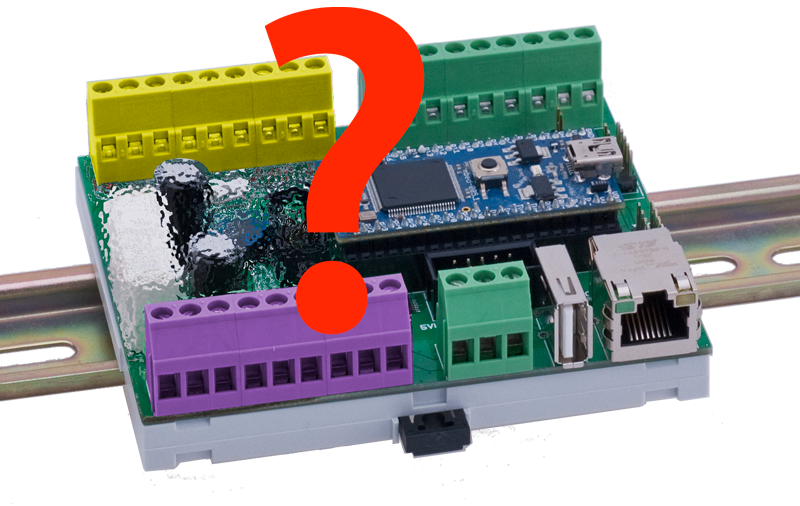 Visit the website for mbed platforms and select the NXP LPC1768. In the right column, click the button "Add to your mbed compiler". and further "expansion boards". There you should find and select mbed Rail 24V. Otherwise you can visit the website with the example code directly. The next steps are obvious: import the demonstration software into the online compiler and prepare your hardware. The LCP1768 module can be programmed while plugged into mbedRail24V (then must turn the 24V present at mbedRail24V) or "free-floating" on an insulated surface. The LPC module logs on after connecting with USB as a drive. 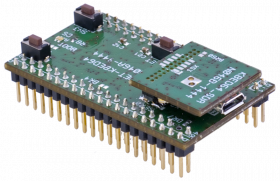 As an alternative to the mbed LPC1768 module, ELZET80's kBed module could be used with the board too. Due to the double rows of pins on KBED, all screw terminals on MBEDRAIL24V are usable and the inner connectors feature more serial options. The Kinetis K60 processor provides a higher performance with DSP functionality, since it is based on the Cortex M4 architecture. 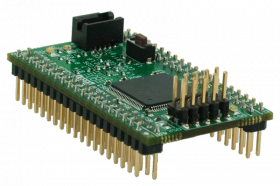 KBED is also available with an additional FPGA chip for time-critical processes. Unfortunately KBED cannot be programmed with the mbed online compiler, at least not now. There is an extensive demonstration software based on the very fast real-time kernel μTasker, which is free of charge for use in non-commercial applications and economically priced for commercial applications. As an alternative to the mbed LPC1768 module, ELZET80's kBed module could be used with the board too. Due to the double rows of pins on KBED, all screw terminals on MBEDRAIL24V are usable and the inner connectors feature more serial options. The Kinetis K64 processor provides a higher performance with DSP functionality, since it is based on the Cortex M4 architecture. Installation leaflet with terminal pinouts and assignments for mbed module. 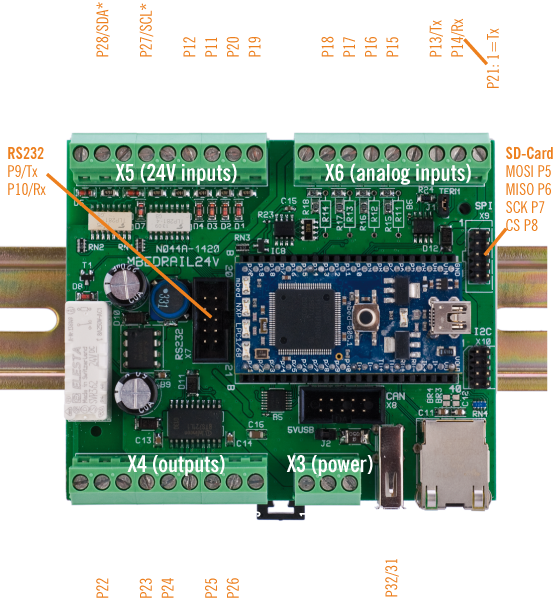 Installation leaflet with terminal pinouts and assignments for kbed module. Diagram of the module is released after testing the sample series.